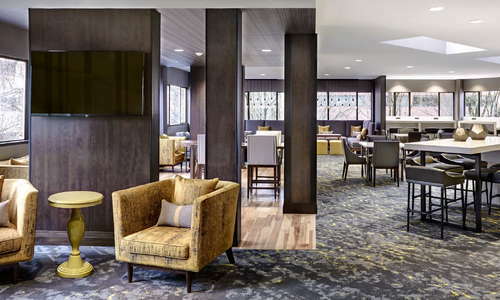 If you’re looking for a reliably comfortable hotel experience with excellent design and sweeping views of the city, you’ll definitely want to check out Portland Marriott Downtown Waterfront. 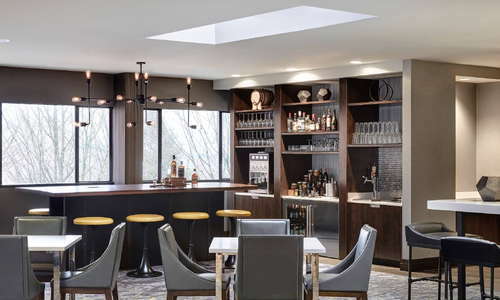 This hotel offers all the amenities you’d expect in a Marriott property with an excellent waterfront location that offers spectacular views of the Willamette River, Hawthorne Bridge, and (if you’re lucky enough to stay there on a clear day) Mt. Hood. 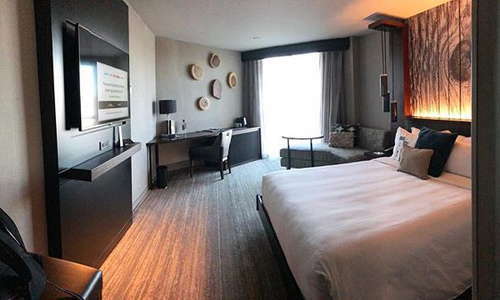 The rooms at Portland Marriott Downtown Waterfront are spacious and comfortable, with plush down comforters, desks with ergonomic chairs, and additional amenities to keep you comfortable (think flat-screens and coffeemakers). 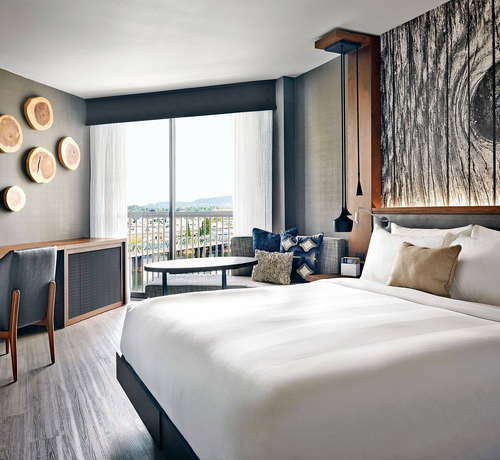 The rooms are also impeccably designed; the modern decor and art by Portland-based artists create a contemporary ambiance that feels more high-end than other Marriott properties in the area. 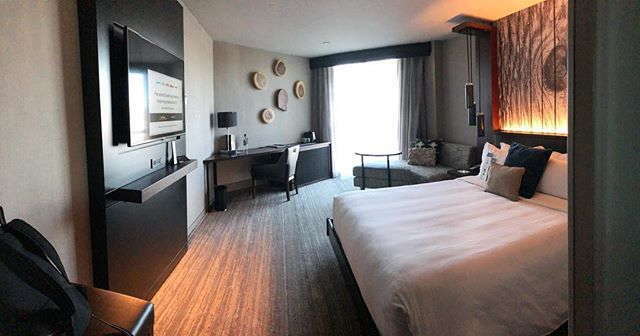 If you want the best views, upgrade to a suite on one of the higher floors, where you can enjoy views of the river from your private balcony. The bathrooms at Portland Marriott Downtown Waterfront are beautifully designed, with modern tile and granite countertops. Some suites also feature walk-in waterfall showers. YOU SHOULD KNOW The bathrooms in the suites are plenty spacious, but in the standard rooms? Not so much. Expect a tight squeeze. 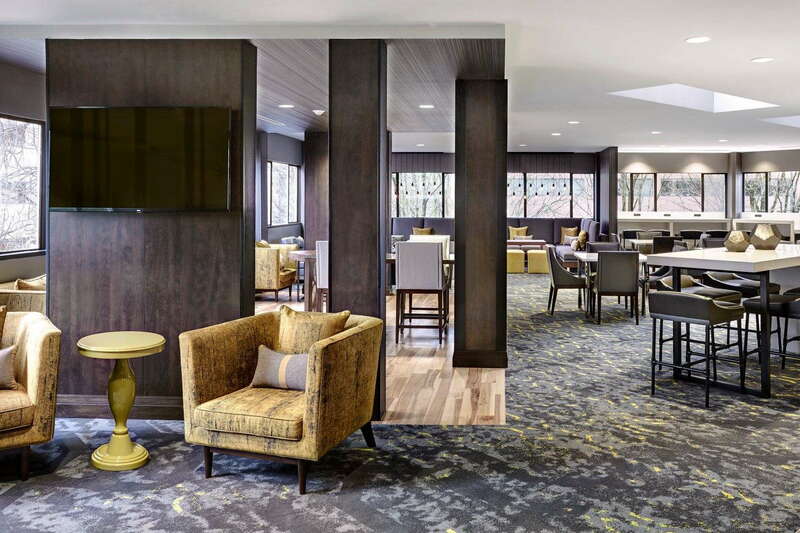 The lobby has a charming feel to it, with bookshelves and plenty of set-off seating areas that are great for sitting and reading a book or enjoying a coffee. The gym at Portland Marriott Downtown Waterfront is open 24/7 and has all the cardio machines and free weights you need to get in a good workout. 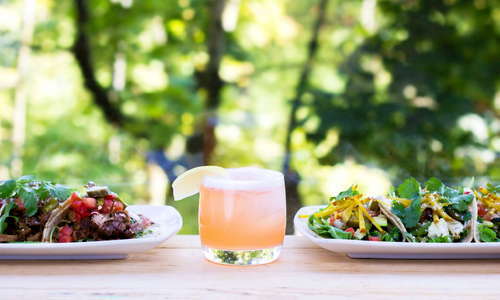 Grab breakfast at Truss, which offers a revolving menu of American staples centered around seasonal ingredients. You can choose to sample from their excellent breakfast buffet or order items a la carte (be sure to try the Salmon Benedict). Truss is also available for private lunches and dinners. Grab a drink Proof·Reader, where you can sample one of over 150 whiskeys on the rocks or mixed into an inventive cocktail. 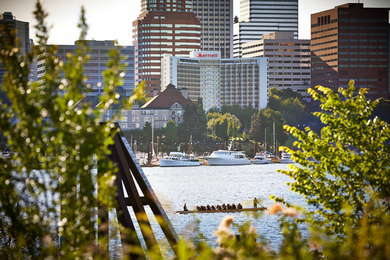 Downtown Portland is an easy place to navigate on foot, and if you need to venture elsewhere in the city, the public transportation is excellent (there are bus stations on nearly every corner and the nearest MAX station is just a few blocks away). If you do bring a car, Portland Marriott Downtown Waterfront charges $42 per night for valet parking. Murata (4-minute walk) is a Japanese restaurant serving some of the best traditional sushi dishes in the city - and if you’re dining with a large group, you can enjoy your meal in a traditional tatami room. 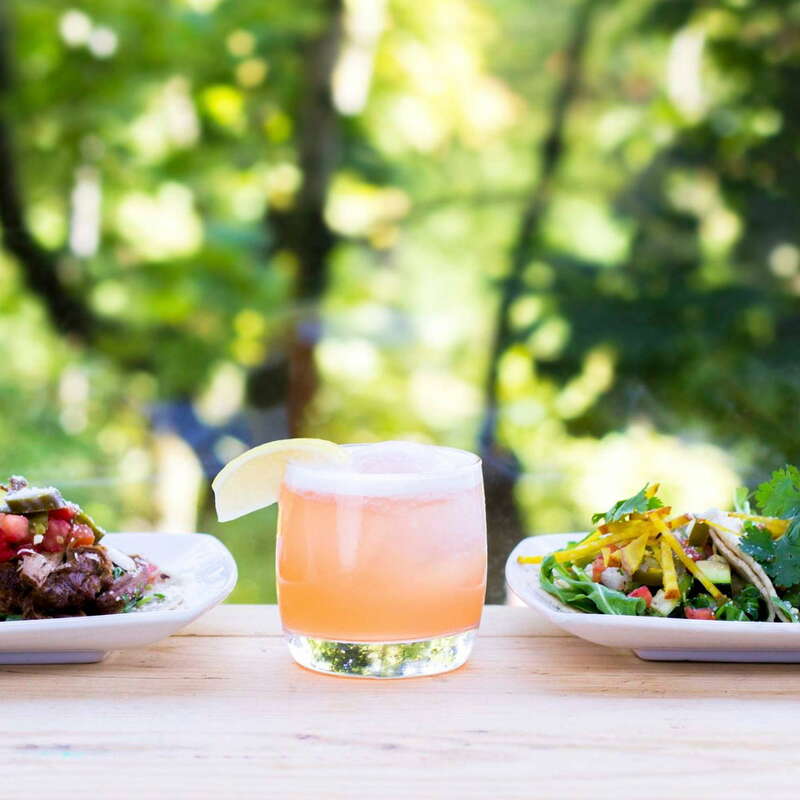 If you're in the mood for something a bit heartier, try Portland Kettle (4-minute walk), where you can build a combo platter of tasty comfort foods like Clam Chowder, Thanksgiving Pita Pockets, and Tater Tot Casserole. No trip to Portland would be complete without a visit to a dive bar, so be sure to check out Yamhill Pub (9-minute walk), where you can scribble on the graffiti wall while you enjoy a PBR. 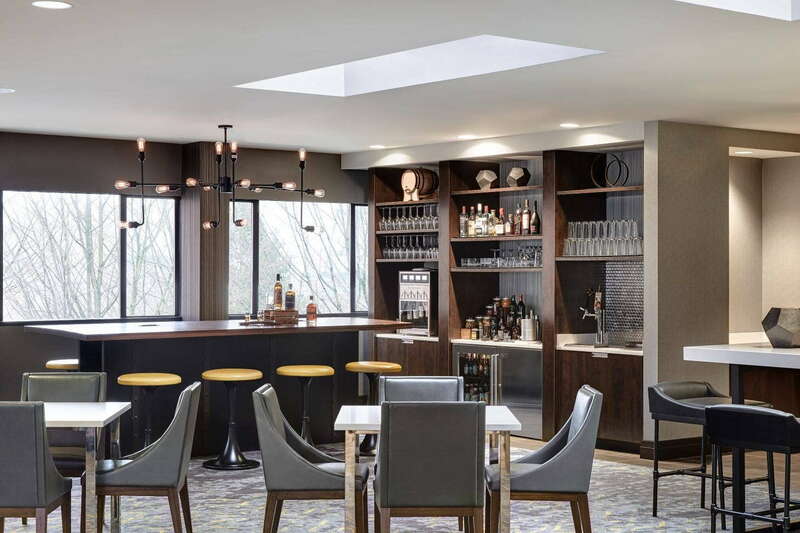 For the opposite of a dive bar experience, try Multnomah Whiskey Library (20-minute walk), where you can sample from a seemingly endless list of high-end whiskeys in a cozy parlor atmosphere. 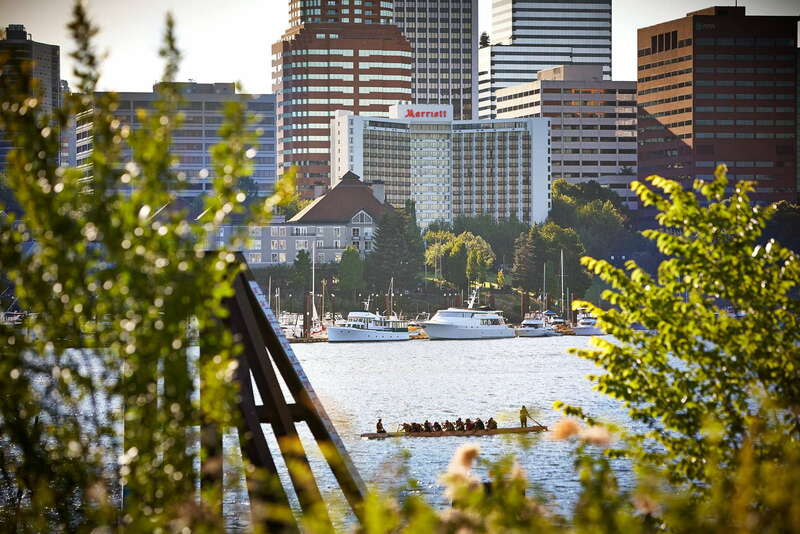 Portland Marriott Downtown Waterfront has all the comforts and amenities you’d expect from a Marriott property with a stellar waterfront location that’s just a stone’s throw from the river and all that downtown Portland has to offer.